To the consummate birder, travel equals opportunity. Any trip, be it for business, pleasure, or obligation, opens the door to the possibility of new birds. Some will be ones you’ve never seen while others just haven’t been seen for a while. In either instance, the consummate birder acts swiftly and decisively to maximize the birding benefits of travel. Because I seek to follow the Tao of the Consummate Birder, my eyes lit up when I was invited to speak at ScienceOnline09. Apart from the obvious honor involved, along with the inevitable excitement of pressing the flesh (professionally, of course) with so many science bloggers I enjoy online relationships with, my mind turned to the potential lifers within easy distance of Research Triangle Park. Mentally cataloguing the options by rarity, aesthetics, and potential discomfort/peril (you do that too, don’t you?) I arrived at a terrific target bird: Red-cockaded Woodpecker. The Red-cockaded Woodpecker (Picoides borealis) is an endangered, nonmigratory, highly localized little tree-tapper disributed throughout the southeastern United States. Similar in appearance to Ladder-backed Woodpecker, this characterful colony nester travels in modest packs and flashes a bold white cheek, stippled black, white, and gray plumage, and a tiny little red facial spot or streak that somehow translates to a cockade. Considering this pleasing picid’s rarity, any birder would be lucky to lay eyes on it. My first day in North Carolina was devoted to ScienceOnline09 and my workshop on blog carnivals, which went very well, thanks for asking. That night found me hobnobbing with the world’s finest marine bloggers, an experience I recommend highly. As I was only staying one night and wanted to experience more of this remarkable science blogging conference, our only window for birding was narrow indeed. Yet, to the consummate birder, time asleep is time better spent birding. This surely explains why Nate and I rendevouzed for a precipitously pre-dawn run to the alluring Longleaf Pine habitat of Weymouth Woods-Sandhills Nature Preserve, about an hour away in Southern Pines. Our plan, brilliant on paper, was to pull in to the Weymouth Woods parking lot, pop out to spot multiple Red-cockaded Woodpeckers, perhaps spy a Bachman’s Sparrow or two, and cruise back to Sigma Xi for the 9:00AM ScienceOnline09 workshop on nature blogging. I really wanted to get back for the workshop! Unfortunately, as so many battle plans do, ours fell apart almost instantly upon contact with the enemy, or more accurately lack of contact. We heard nothing from our target birds. While we reviewed bird calls en route to Weymouth Woods, Nate astutely noted how so many of the birds in this habitat, such as Brown-headed Nuthatch and our woodpeckers, share similarly squeaky calls. 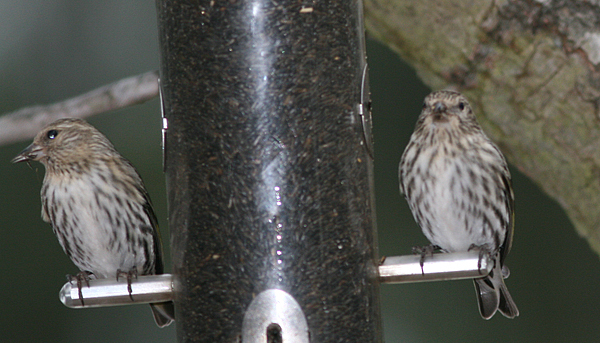 Yet the only squeaks coming out of the pines came from, what else, Pine Siskins. Another very welcome species that wasn’t much of a surprise considering the conifer cover was burnished gold Pine Warbler. The feeders at Weymouth Woods sustained Chipping Sparrows, Eastern Towhees, Dark-eyed Juncos, and White-breasted Nuthatches. 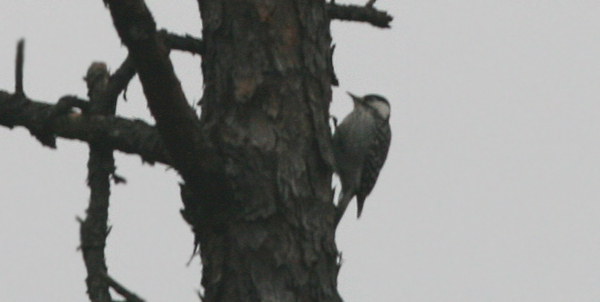 But the only woodpecker we spied was a sapsucker, Yellow-bellied to be precise. In the dim dawn light, things started to heat up. American Goldfinch and Brown-headed Nuthatches came and went in the bushy canopy of longleaf pines. Carolina Chickadees cruised onto the scene. Tiny birds barraged the scrub and firegrass. Our quarry, however, remained silent… too silent. All too soon, it was time to head back to the conference. Nate and I couldn’t let a bunch of science bloggers, no matter how talented, talk nature blogs without being on hand to represent our community, could we? Could we? It was at that moment that the true Tao of Blogging, different from the way of the Consummate Birder yet inextricably linked, struck me like a bolt from the blue. For those who are moved to blog about their passions, sometimes the blog must come first and sometimes the passion must come first. Confident that any one of you nature bloggers would have done the same in our hiking shoes, we slogged on in search of our woodpecker! Now, if you’ve been following my adventures, such as they are, for any length of time, you know that I’ve stalked a few birds in my day. Whether it was Golden-cheeked Warbler in the Texas Hill Country or California Gnatcatcher along the Pacific Coast, the narrative tends to follow the same beats. I search and search and search. The bird eludes me. I run out of time. The bird turns up at the last possible moment, often right at the spot I began. Guess how this tale ends? As we trudged bone-chilled and weary back to the car, we heard a promising squeak, one possessing a subtle qualitative difference from the squeaks of nuthatches or siskins. We hustled back to the feeders but saw only the same array of avians we spotted earlier. Then just as rain started to fall more vocalizations erupted, the kind of conversations that herald a wave of gregarious woodpeckers with red cockades. In no time at all, Nate (who is an outstanding birder who I had no intention at all of publicly ridiculing if we failed to find our target species) spotted a trio of woodpeckers working the bark on a dead tree. Those white cheeks looked good. That glaucous plumage looked good. The cockades… well, I couldn’t make them out in the dim, drizzly conditions, but I didn’t need to. We had tracked down Red-cockaded Woodpecker! A bad photo of a great woodpecker! With no time to bask in the afterglow, we hightailed it back to the conference. Unfortunately, we got back too late for the nature blogging workshop and anyway, we were in need of breakfast. After that, the conference pretty much got away from me, which I regret tremendously. On the other hand, I did rack up some sweet road birds like Bald Eagle, Red-shouldered Hawk, American Kestrel, and both Black and Turkey Vultures. Even the most consummate birder can’t get it all done at once. But by following the Tao (and Nate) the most important tasks were executed with aplomb, most especially a successful stakeout of the Red-cockaded Woodpecker. Man, I’m glad we found those birds, my reputation as a birder and blogger was definitely on the line! The last few times I’ve looked for them they’ve been similarly non-forthcoming. My mojo must be broken or something. And, for what it’s worth, for all the times I’ve spotted them, I’ve never seen the cockade. Congrats to both, Mike for successfully stalking and Nate for providing the view – stressful aspects of birding from both ends! Mike, we missed you in Rochester. It was a great but non-mojo filled lakeshore trip, no Snowies or Harlequins. One phenomenal look at a Peregrine made up for that. One of these days I’ll blog about it . . . . Thank you for your post.I do not know much about wood peckers,thaugh i had posted pictures of kerala wood peckers in my blog. i reached you from bird snipping and linked you. Sounds like a great time- Weymouth Woods Sandhills Nature Preserve looks incredible. And yes we are all thankful for your dedication and passion for the 10,000 birds blog.. It truly is a wonderful thing- thanks to you and your team. Glad you guys were able to track down the Red-cockaded Woodpeckers – what great birds! And something about their threatened/endangered status makes it all the more satisfying when you do see them. Like the Ruby-crowned Kinglets eponymous crown, it is rare to see the cockade – the bird has to be pretty excited over something, and you’ve got to look fast! We were worried when we didn’t see you at the conference Sunday morning, though you might have been carried off by bears. Glad you found your woodpecker! It was fantastic to meet you this weekend and glad you chose to sit down with the marine bloggers for dinner! It was our pleasure to entertain you. While we would have benefitted from your experience a the Nature Blogging session, I completely understand the predicament and would have done the same! Grrlscientist made sure birds were at the top of the list. Looking forward to next years and hope you can make it again. Heh, I was wondering where you went on Sunday! I’m really glad you had dinner at the marine table – it was great to meet & geek out with you! Thanks all. I do regret the things I missed that morning (science conference, Rochester birding) but the trade off was worth it! And believe me, Kevin and Miriam, nobody is happier than I am that I could sit with you all at dinner. I sought you all out because marine bloggers are party people. Great story, Mike! And now I’m afraid you’ve given me the bug… I’m gonna have to head up to the Texas piney woods pretty soon on a quest for red-cockaded woodpeckers. Hmmm…maybe I am lucky, as far as birding goes anyway. I live right outside of Ft. Bragg, NC and I usually find a few in my back yard every summer. I just spotted my first one for this year. Last summer I even had one looking for lunch on the side of my house. When I tried to shoo it away because I did not want a hole in my roof overhang, the fella just ignored me and started pecking on the house once more. I know that Bragg is a safe-haven for the birds and they are beautiful to watch. I wanted to let someone know that I spotted a tagged red cockaded woodpecker in my yard. It was around 6:00 PM in Newport, North Carolina on March 10th. 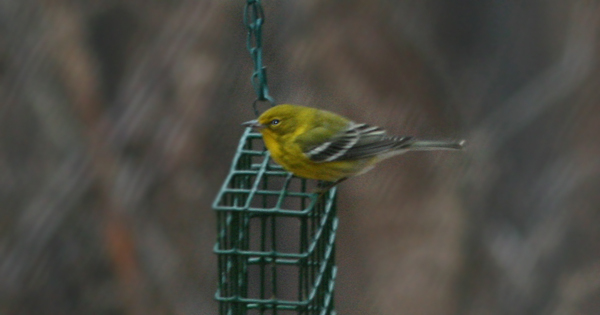 The bird had a bright yellow tag on its left leg. I don’t know who is tracking this bird. I’m hoping you might know who to contact. Thanks this is soo great for helping me with my school project thank you!!! This is so very educating and well told. I would love to read more of your work. But for now I only need this one for my school project. Thanks to you it is going to be amazing!! My husband and I saw a pair of Red-cockades this morning and I was delighted to find this site. We are not well versed birdwathers and ,at first ,thought they were an unusual type of finch. When the male began tapping on the black oak we realized they were wood peckers. The red on either side of the males head then became visable. I immediately investigated and was thrilled to find that the sightings are somewhat rare. We live on a small peninisula in Poquoson ,Virgina and have a 100 year old pine tree in our yard. I certainly hope that they have chosen this tree as their nesting sight. Thank you for this informative website. We are fortunate to have a number of exciting birds in our area and it is so nice to know what we are actually seeing.